You may have noticed that we did not post a blog yesterday. This is partially because we have been kind of busy, but mainly because we are bemused by the events of last week and its fallout. We are disappointed by the result, because it improves nobody's life. People who voted to remain like us are aghast at the rhetoric used, and the people who bought into the rhetoric are now finding out that they will not get anything they thought they were voting for. The Guardian had an interesting link to a blog post by Vytenis Andriukaitis, an MEP from Lithuania. The Traffic's getting... Better?? Worse?? Certainly more attractive, that's for sure! 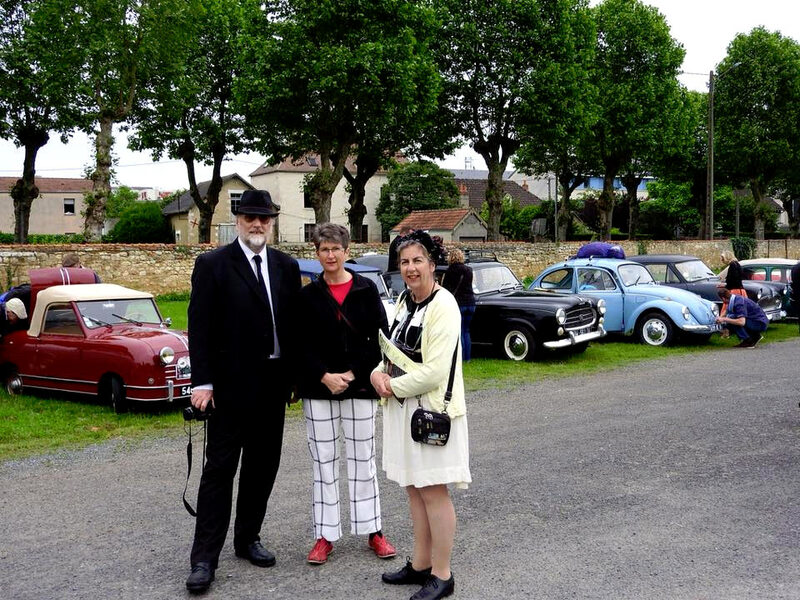 This year Susan's sister Kathy and brother-in-law John were with us, so we all dressed up, started Célestine, and toddled off down the road. This year there was about 200 cars of all ages (and sizes) and we had a ball. 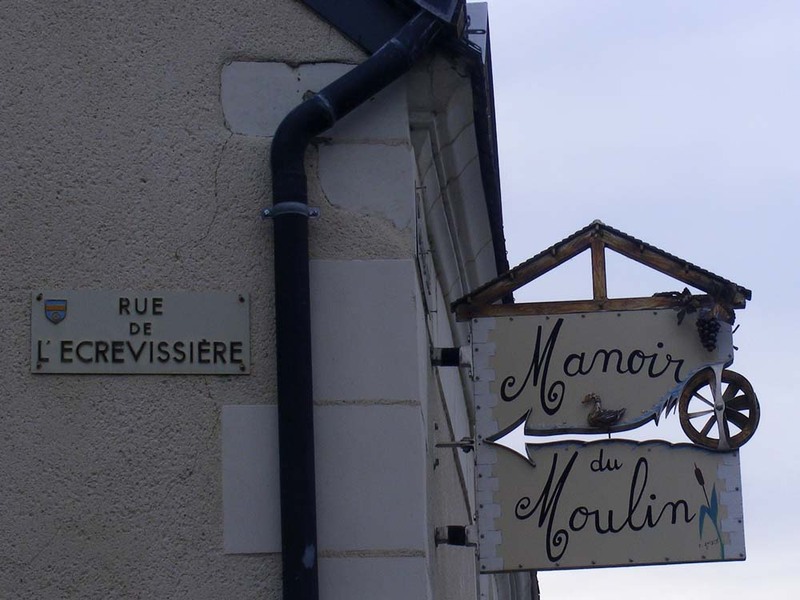 The program was the same as last time: a 60km drive through the Brenne before lunch (with a stop for morning tea of boudin noir and red wine), a couple of hours lunch and then two hours of some serious horn action in the middle of town. All this for 15€ a head. This is a handmade car inspired by the Buccialis coachworks of the 1930s. 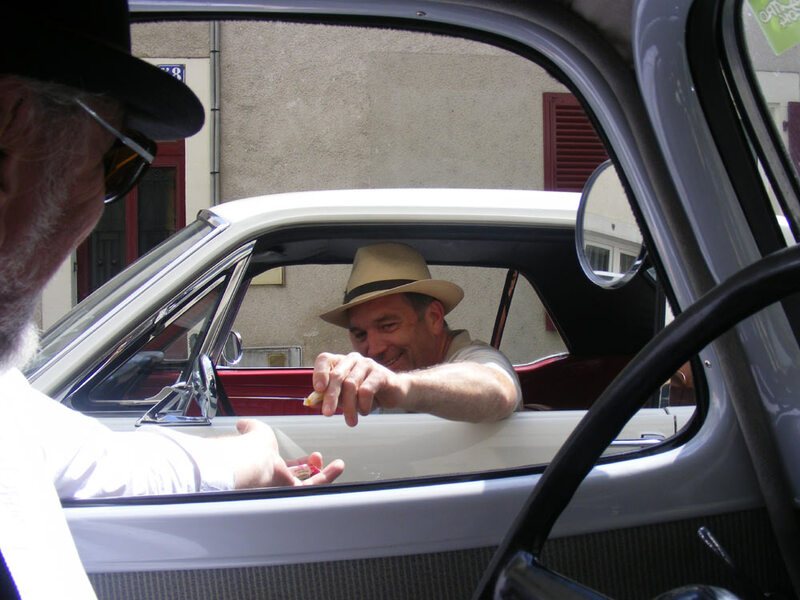 Our friend Fabien handing out candy from his 1965(?) Mustang. All in all, a great day and one we will remember for a long time. 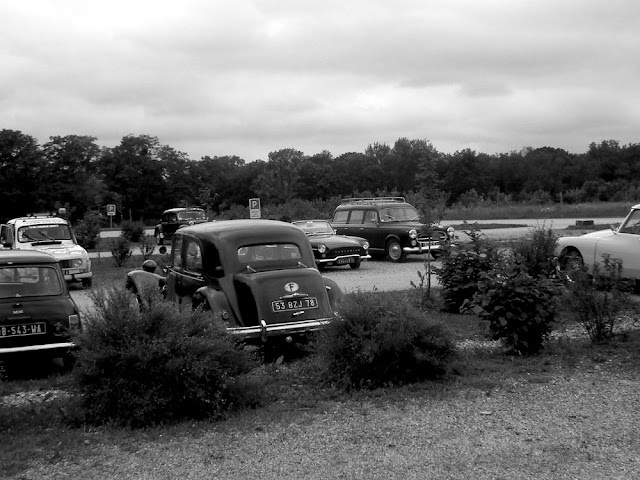 The weather played ball, so although the morning drive was overcast the afternoon was hot, making an ice cream stop (once gridlock had been acheived) a very pleasant and welcome break. There is an album of photos here. Looking down into an inner courtyard in the impressive Castello Sforzesco. 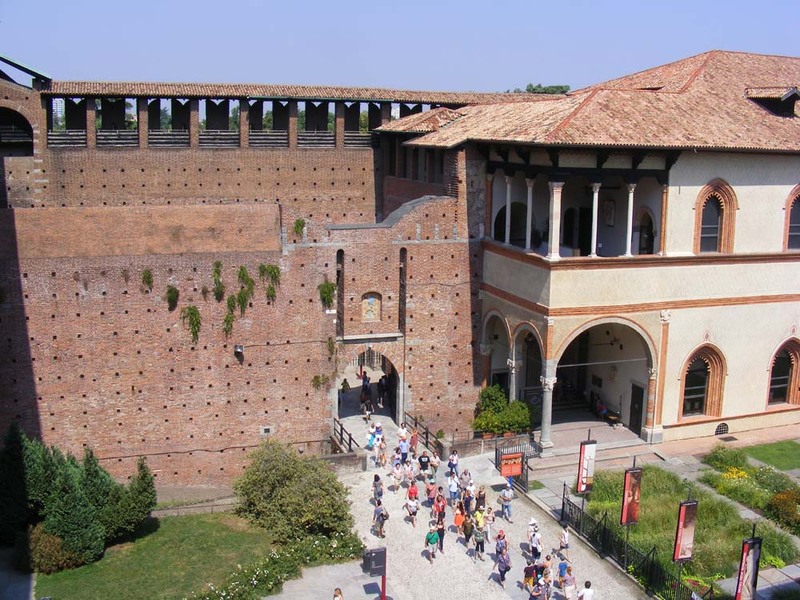 On Mondays our blog posts are about the northern Italian city of Milan. For more of them, click here. Quiz Answers: Saturday's quiz has been updated with answers. 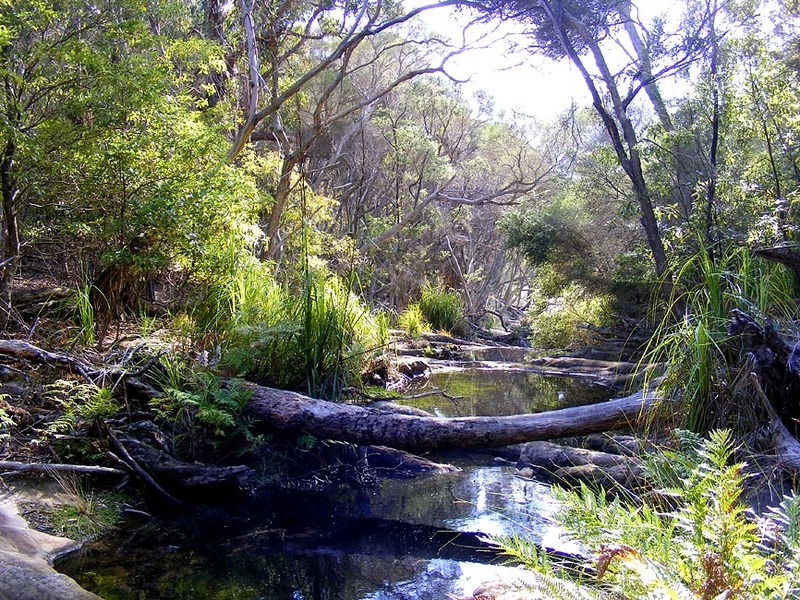 A creek flowing down to the New South Wales coast. Most small rivers and large streams are known as creeks in Australia, whether they empty into an estuary or are well inland and feed a river. Our posts on Sunday have an Australian theme. To see more click here. 2 points if you can accurately identify it. I want more than just which town or village, but where it is in the town and what it is. 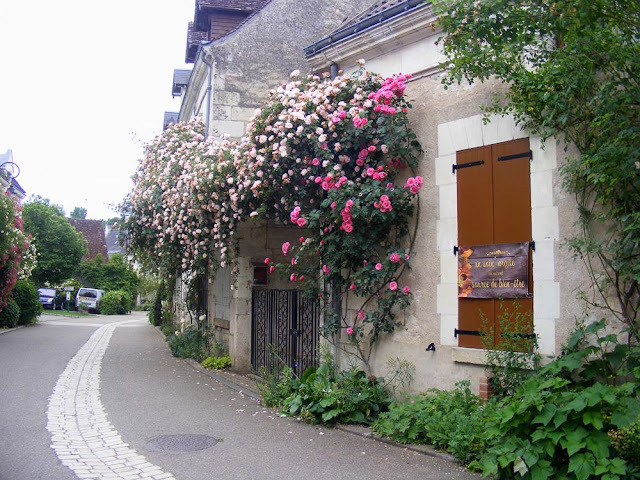 Answers: This house is in Montrésor. It is the home of the Re family, owners of the Chateau of Montrésor, and situated in the grounds of the Chateau. This building is not open to the public though. The last time we were at Clos Roussely, a winery we use at Angé in the Cher Valley, I was delighted to see that there were Sand Martin Riparia riparia nesting in the drain pipes which project out of the retaining wall that forms the front part of the cellar. 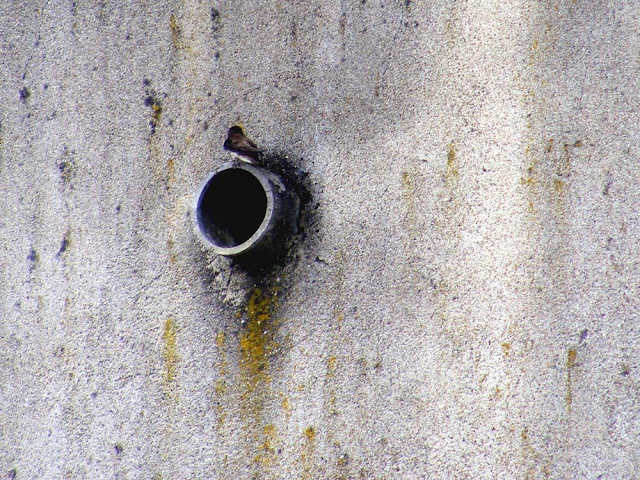 Sand Martins are kind of the forgotten hirundine. 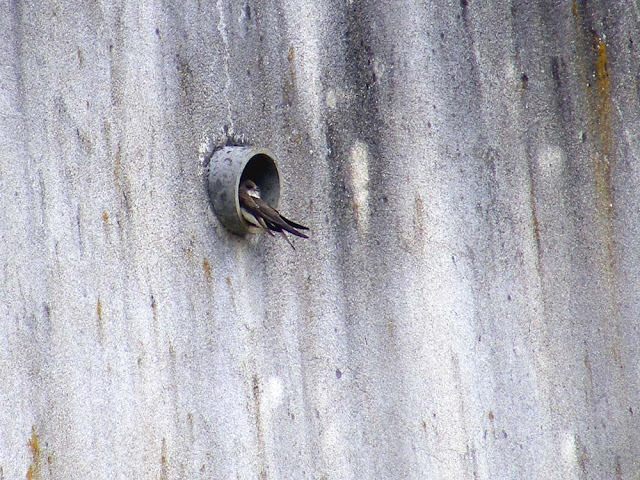 They are not so dependent on man as Barn Swallows, House Martins and Swifts for nesting spaces and so rarely interact with people so closely. 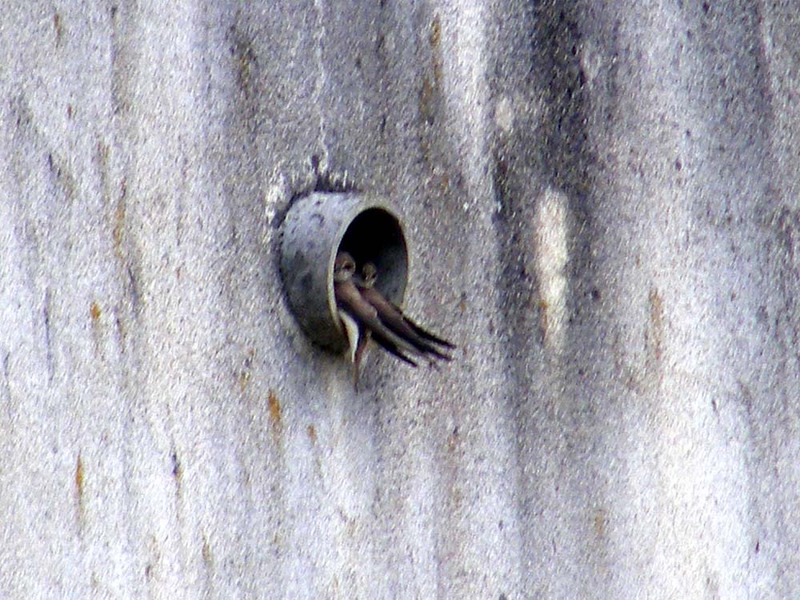 In fact, I've never before seen Sand Martins nesting in a manmade structure that wasn't purpose built for them. The birds are small and lively, coloured ash grey brown and pure white, rather smart in their own understated way. 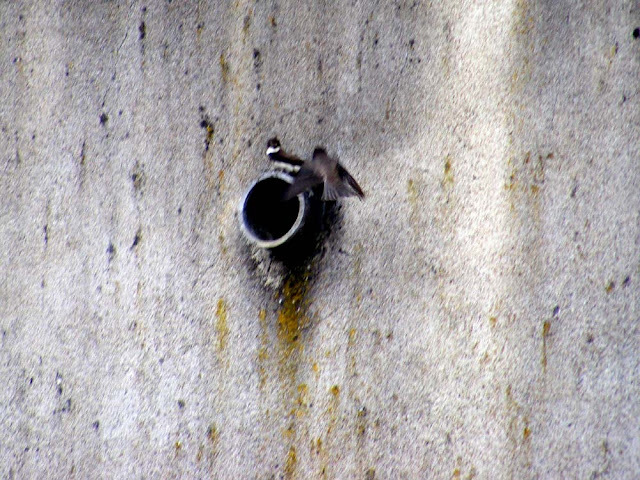 Like their cousins they feed on insects caught on the wing and because they normally nest in river banks and the sides of gravel pits, they are normally seen zipping about over the rivers here. The species is known as Bank Swallow in the Americas, Collared Sand Martin in South Asia and Hirondelle de rivage in France. Like the other hirondines it is migratory, but it occurs very widely around the world, spending its summers breeding in Europe, North Africa, the Middle East, northern Asia and North America, and wintering in eastern and southern Africa, South America and South Asia. 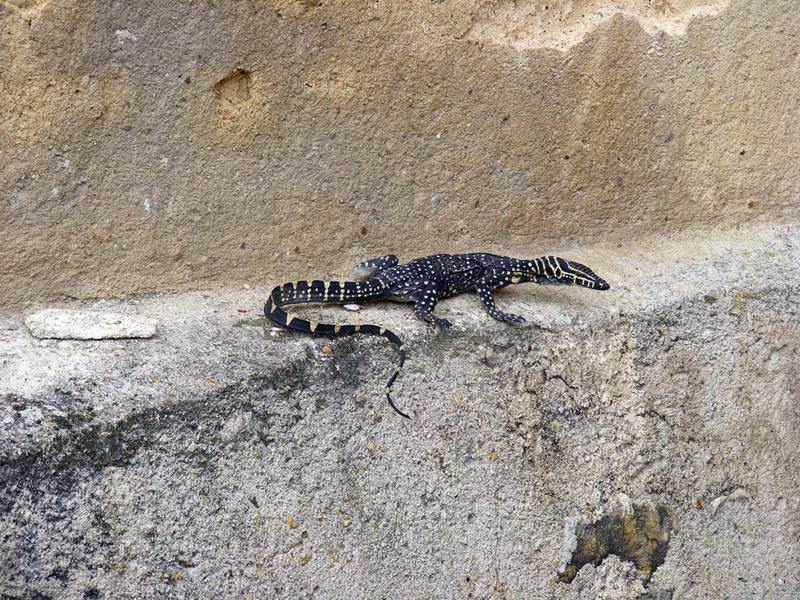 Although their population has declined markedly, they are not considered rare or endangered. The other day I was botanising on a site that not only has fantastic orchids and other plants associated with warm limestone slopes, but also has a considerable population of Roman Snail Helix pomatia (Fr. Escargot de Bourgogne or gros blanc). Surprisingly many of the snails were out on the open chalk ground in the middle of quite a hot day (one of the few we've had this year...). What were they doing? One couple appeared to be preparing to mate, but most of the snails were on their own, and most of them, although large, were sub-adult. Were they collecting calcium for shell building (maybe the epiphragm used to seal them in the shell for estivation)? If so, why did they have to do it out in the open, which seems a bit risky? If any readers have any ideas I'd be interested to hear them. These two appear to be courting. Escargots à la bourguignonne is a traditional French dish based on Helix pomatia served at the Christmas eve family dinner. Snails have been eaten by humans since the dawn of time and the Roman Snail is distributed across eastern and central France. About 30 000 tonnes of snails are consumed in France annually, of which only about a thousand tonnes are farmed in France. The term Escargot de bourgogne is a protected name, and only Roman Snails may be used in a dish referred to as Escargot de bourgogne. 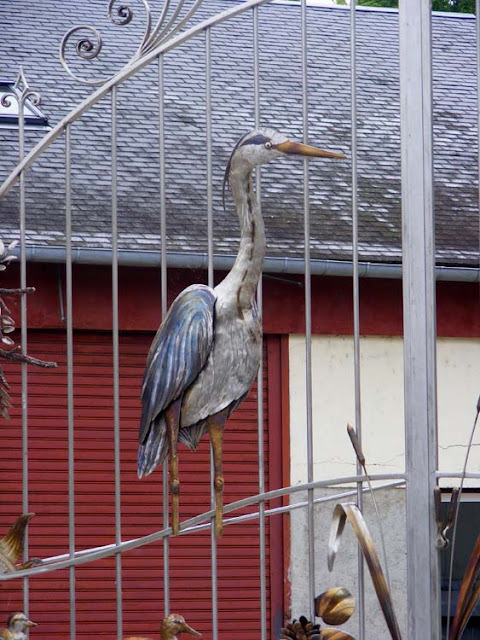 The species has been protected in France since 1979 due to its declining population, and collecting and selling them is regulated. Like so many wild creatures, they are declining due to the intensification of agriculture, modern drainage and habitat loss. 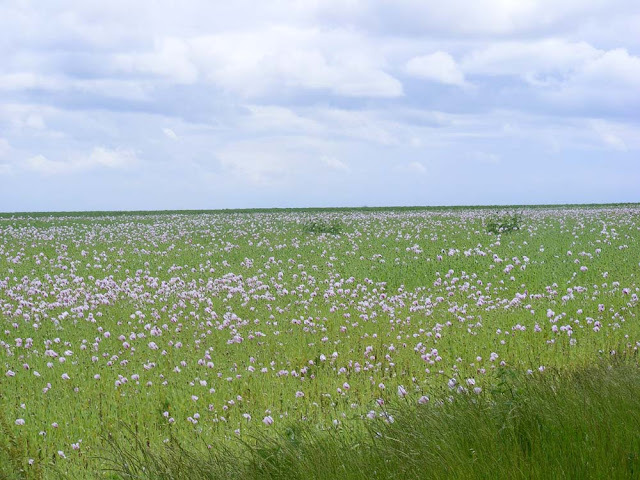 Collecting them during the spring breeding period (1 April to 30 June) is forbidden. Collecting and selling them between 1 July and 31 March is allowed, so long as the shell has reached a diameter of 3 cm or more. 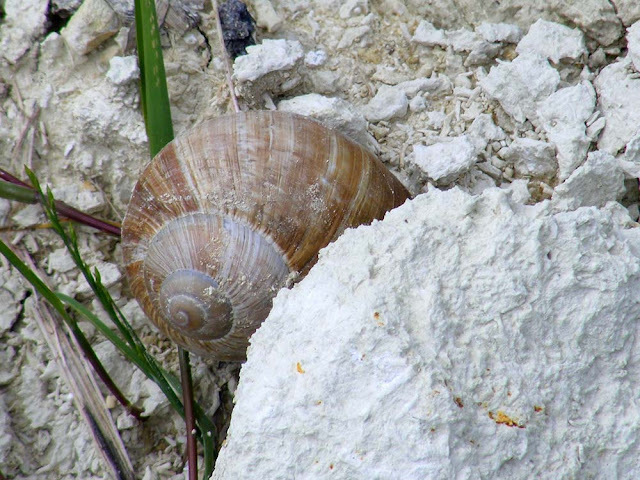 A mature snail has a white reflexed rim and they take two to seven years to reach maturity. They can live for up to 35 years, and 10 to 20 year old snails in the wild would not be uncommon. Wild collection is insufficient to supply the market and is mainly just for personal consumption. The snails served in restaurants have sometimes come from French snail farms or more likely, imported from Poland and other Eastern European countries in great quantities and at low cost. 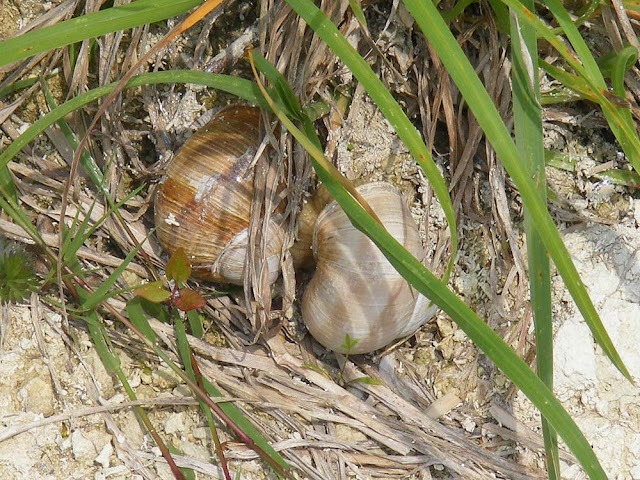 Commercial snails must be labelled with their country of origin and where they were processed. The Manoir du Moulin in central Onzain is a former wine co-operative that is now run as bed and breakfast accommodation and an events venue. 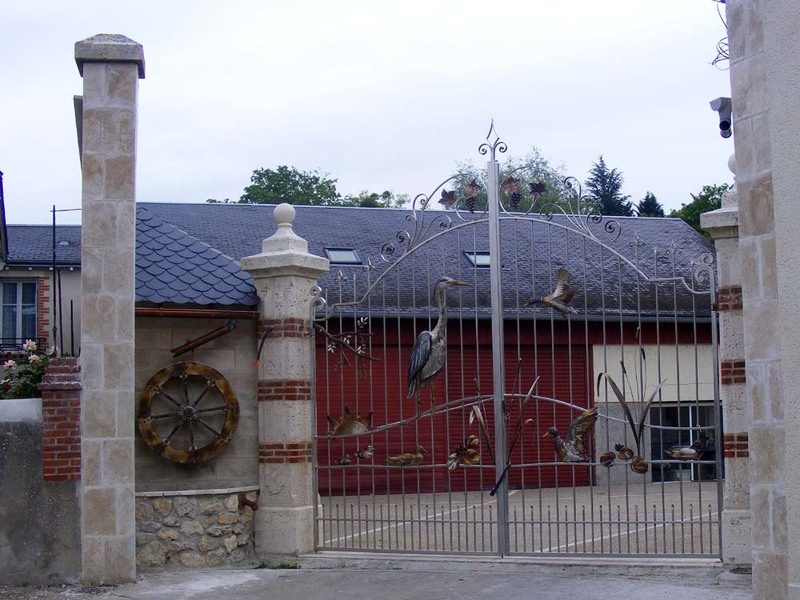 The front gate is a fabulous representation of the Loire river and its wildlife, viticulture and mill heritage. I don't know who the sculptor is, but there is an artist who works in metal living in Onzain so it is likely to be his work. We have encountered other metal sculptures in nearby villages that are probably his too. I somehow failed to take a photo of the giant yabby that is on the side gate. Dammit! However, you can see it if you go to my friend Rosemary's blog. 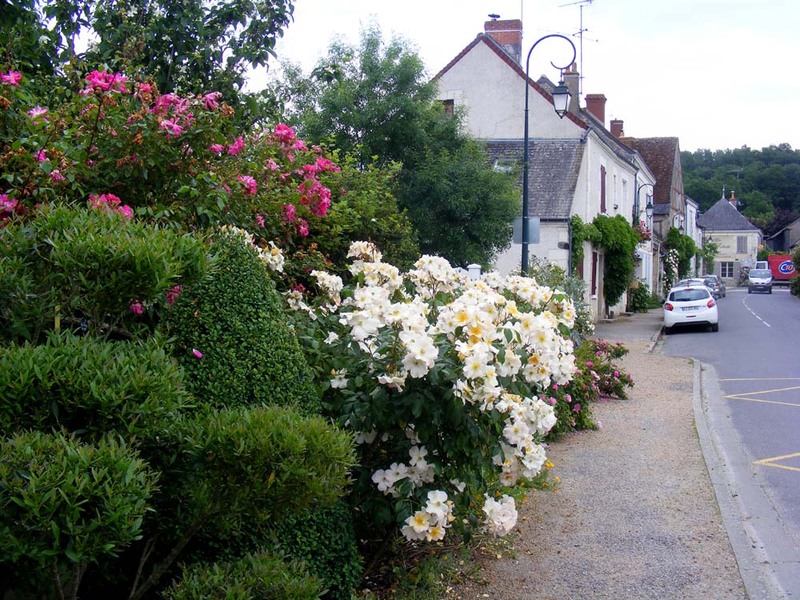 Garden villages don't get that way by themselves. Note the council guy and his little electric truck. These photos were all taken on 10 June 2016, after days of torrential rain and floods. The scent was amazing. However, one of these photos does not belong with the others. 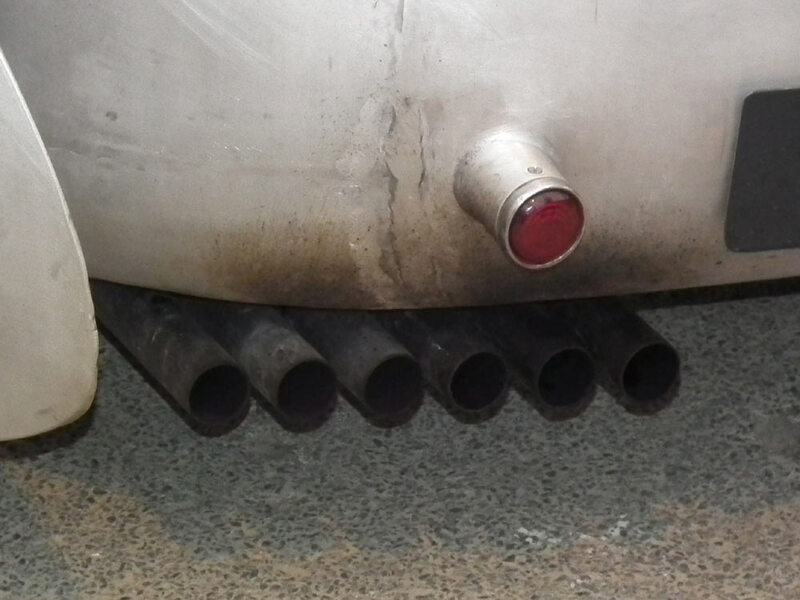 Can you identify which one and why? Brexit: The most lucid and knowledgeable lecture on the pros and cons of leaving the EU, given by Professor Michael Dougan of Liverpool University. Check it out. It is fascinating, serious but not too dry. The video is about half an hour in length. 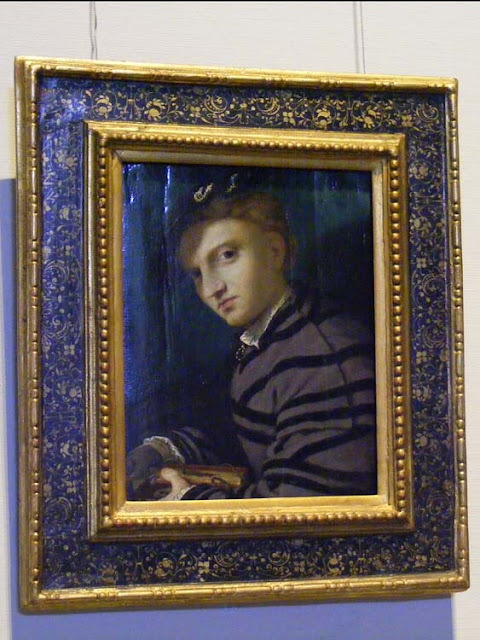 Portrait of Lorenzo Lenzi by Bronzino, 1527-28. Bronzino is one of the most talented portraits of the Florentine court. The Lenzi family were second only to the Medicis and young Lorenzo was about 11 years old in this portrait. His maternal uncles were great patrons of the arts. He was the protege of a family friend and poet, and this portrait was probably done while he stayed with this older mentor, outside of the city to escape the plague. The book is poetry written by his mentor. His father died a year later and his uncles, brothers and mentor brought him up and paid for his education. As an adult he moved to Bologna, studied law and became a bishop. In his forties he is sent to France as an ambassador, probably partly because of his distant kinship to the French Queen Catherine de Medici. 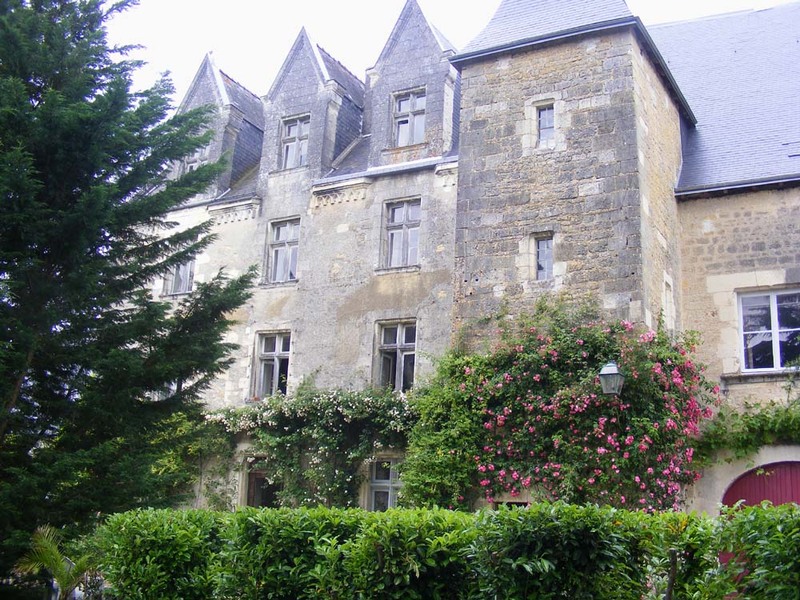 He was a witness to the Amboise Conspiracy and is closely associated with the Guise family and the Catholic faction. After spending a decade in France he dies in Italy aged 55. We know a lot about his life because much of his correspondence survives. 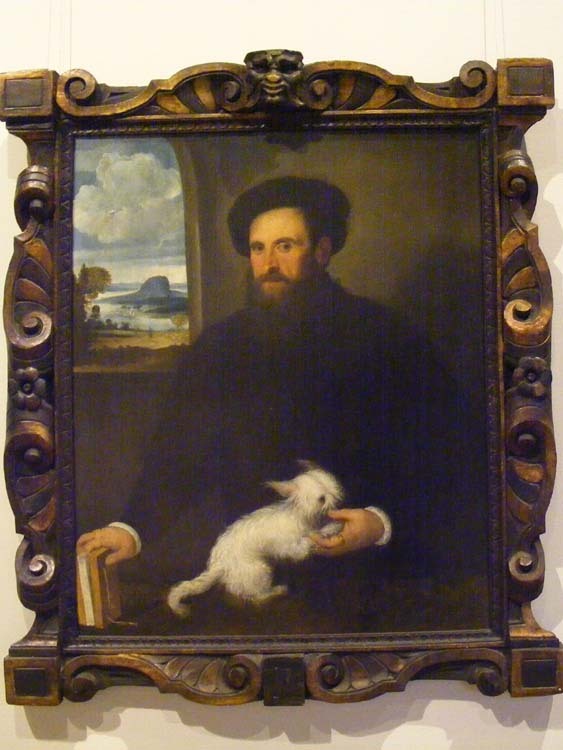 Portrait of a Gentleman with his Dog by Antonio Sacchiense, 1530. I love the way this wealthy educated beardy bloke has had his portrait painted with his funny little pooch, presumably a much loved pet. I assume the artist, whose real name is Licinio, is related to the other artist of that name mentioned below, but I can't find out any details. Portrait of a Youth by Lorenzo Lotto, 1524-27. 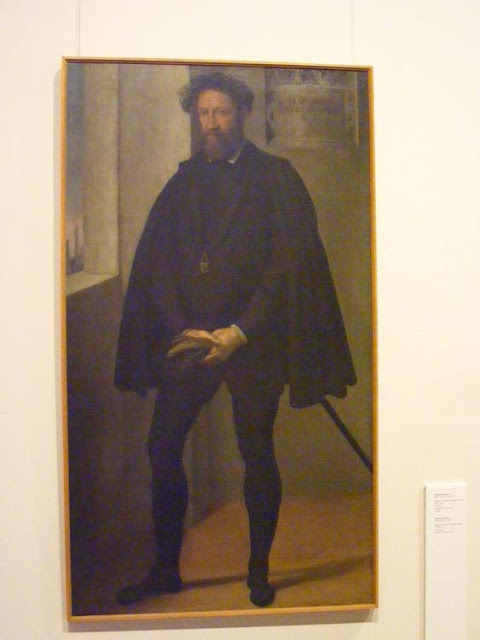 Lorenzo Lotto is a bit of an oddball. He's one of the earliest Mannerist painters so his subjects are often positioned in uncomfortable and unlikely looking poses, with elongated body parts. He was much in demand in his lifetime, but fell out of fashion in his seventies and has never really had a revival. Once he could no longer make a living as a painter he joined a monastery as a lay brother. He is one of the painters I was introduced to when I lived and worked in London, so I have a bit of a soft spot for him despite his awkwardness. The reason I took this photo is because this man is absolutely typical of a 16th century gentleman -- dressed head to toe in deepest black, bearded and serious looking. I couldn't identify the artist or the subject unfortunately. 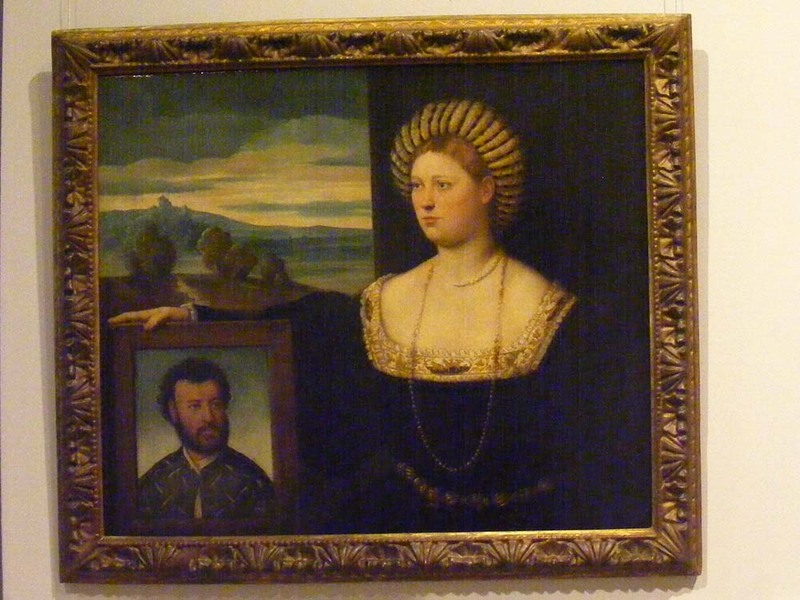 Portrait of a Woman Holding Her Husband's Portrait, by Bernardino Licinio, 1530. I found this painting surprisingly moving. It is a portrait of a woman (who was once believed to be Isabella d'Este), holding a portrait of her husband. It is clear that the husband is absent, and I assume probably in fact dead. If the woman is Isabella d'Este then the man must be Francesco II Gonzaga, Marquess of Mantua. There are known portraits of both of them, and although I could believe the woman is Isabella, the man looks nothing like Francesco. What I find so touching about this painting is that these two people appear to be ordinary looking and in their prime. It is sad to think that this woman must shortly go back to her father's house and try to negotiate a second advantageous marriage. If she has children they will not be allowed to go with her but must remain with their father's family. No wonder she looks pensive. He looks vigorous and determined. It is hard to believe he never lives to achieve his ambitions. The artist, Bernardino Licinio, came from Lombardy, but until relatively recently we knew nothing about him and many of his paintings were wrongly attributed. Vasari, who is the source of much background information about 16th century Italian artists, had mixed him up with another artist and so there was no entry in his 'Lives of the Most Excellent Painters, Sculptors and Architects' for Licinio. 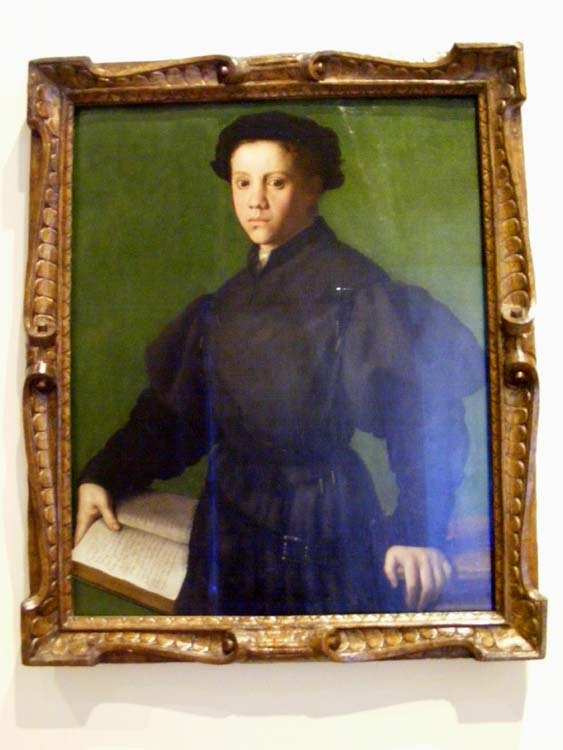 A quick twirl around any fine arts gallery with a collection from the 16th century will reveal that black was a very fashionable colour at that time. The reason is the dominance of the Spanish court, who chose to project an aura of sombre richness. Also black is an expensive dye that doesn't wear very well so to wear black was a demonstration of wealth. Even in the more licentious and frivolous French and Italian courts black was the choice of many, for portraits at least. And once the Protestant movement got underway, restrained and businesslike black was adopted by those who would reform the Church too. All of these portraits hang in the Castello Sforzesco in Milan. On Mondays our blog posts are dedicated to the northern Italian city of Milan. If you want to read more, click here. Until recently this was my father's domain. 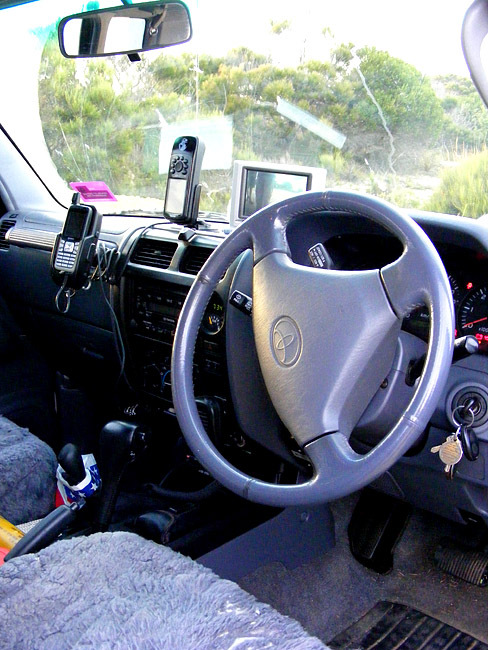 It's the cockpit of his four wheel drive, and ideally it would have had a caravan attached. He and my mother would have been off to somewhere wild and natural for some birdwatching and camping with friends. 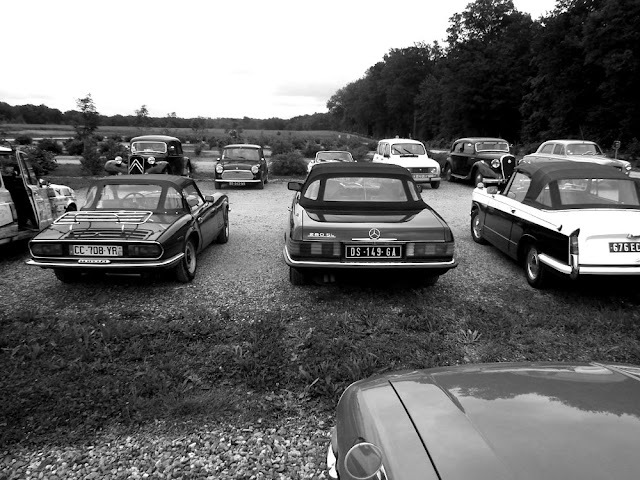 Because they often went to very isolated places my father drove surrounded by comms – short wave radio, mobile phone, GPS, and CCTV to tell him what was behind. A few months ago he reluctantly took the decision that neither he nor my mother are fit enough to be going off camping in the bush any more. He put the caravan up for sale and a woman from a nearby town has bought it. It sounds like it is going to a good home, but Dad will miss it a lot. On Sundays our blog posts have an Australian theme. To read more of them click here. What is Wrong With These Images? 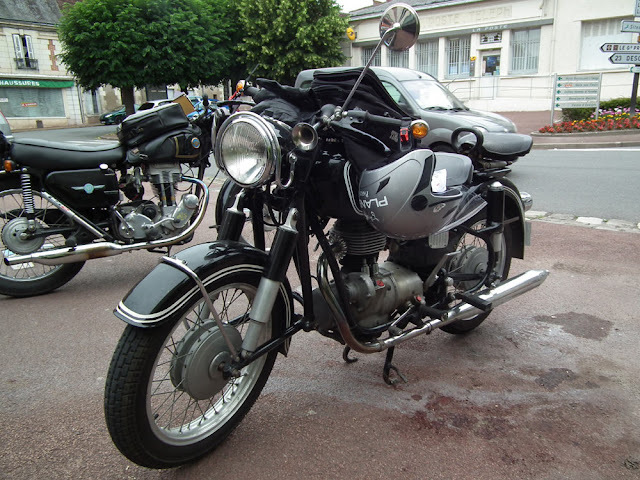 Then, a week later I was driving home from Loches and I passed a large group of classic motorbikes. Stopping to chat to a few who were in the car park at the Mairie in Preuilly I found out there was 48 bikes in the 2nd "Tour de Indre et Loire", and that they were heading to Azay le Rideau. 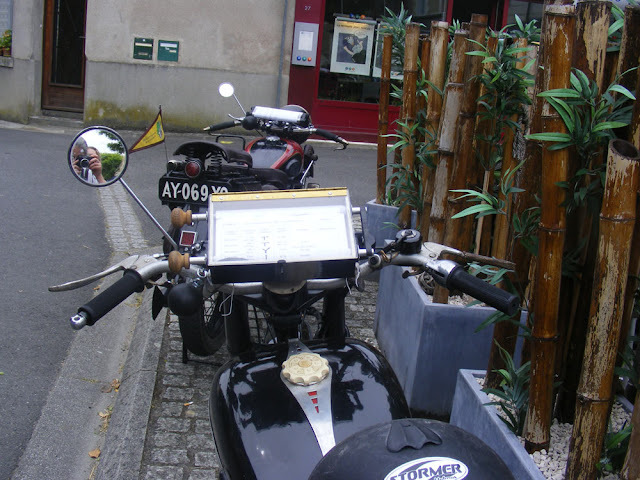 I had obviously only been shown page 1 and 3 of the route, because we later ran in to them at the café in Montrésor, a bike riders' favorite stop. As our client was a bit of a bike fan it was an absolute bonus for him: most unexpected, but this kind of thing has a habit of happening. Susan also took a movie - turn the sound up, and enjoy the noise! 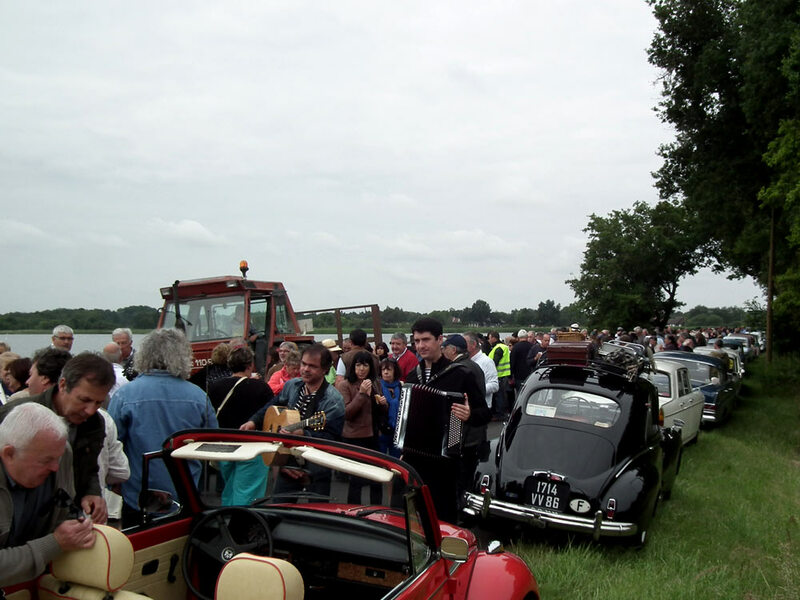 There will be more old machinery coming up on the blog in a couple of days: the traffic jam is happening in le Blanc on Sunday. 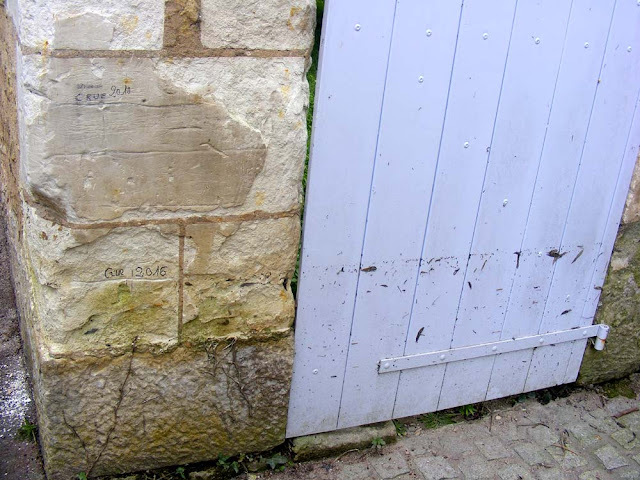 Markers on a garden wall and residue on the garden door. 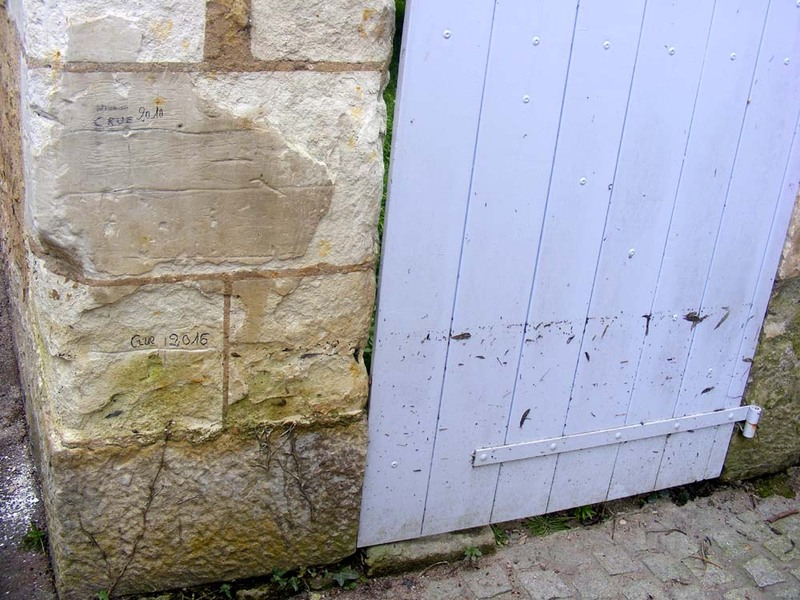 We spotted this flood marker on a garden wall near the lavoir (public laundry) in Montrésor a few days after the recent floods had receded. 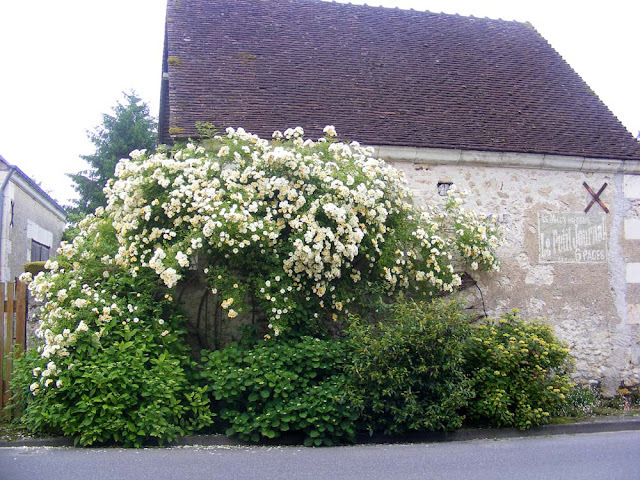 The lavoir itself had been flooded to the roof and the timber framed buildings and former chapel further up the slope had not escaped the rising water. Montrésor is on the Indrois river, and as the flood markers reveal, it floods frequently. In 2010 the water was clearly considerably higher. 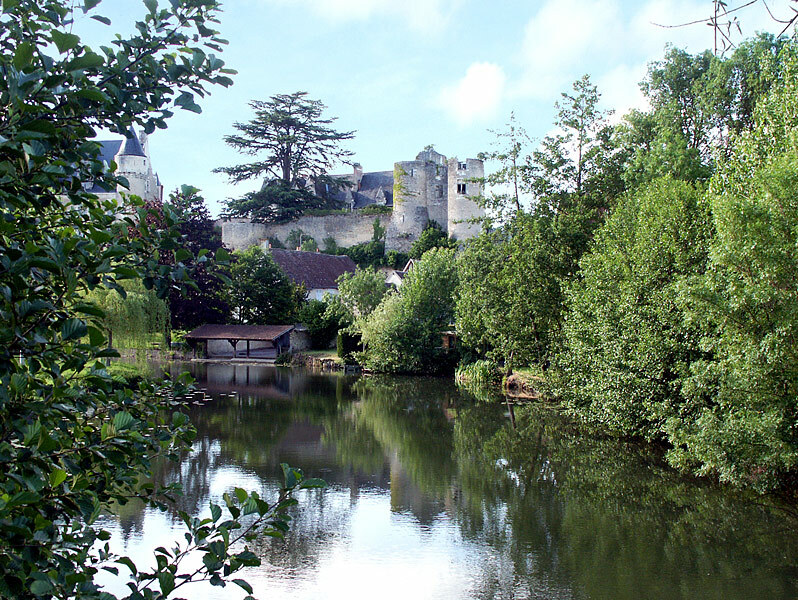 This is what the lavoir and river look like normally at Montrésor. The flood marker in the first photo belongs to the house you can see immediately behind the lavoir in the photo above. Later in the day Simon picked up an interchange between a couple of Preuilly residents on Facebook. Apparently there was a problem with the town water and we were not to drink it. 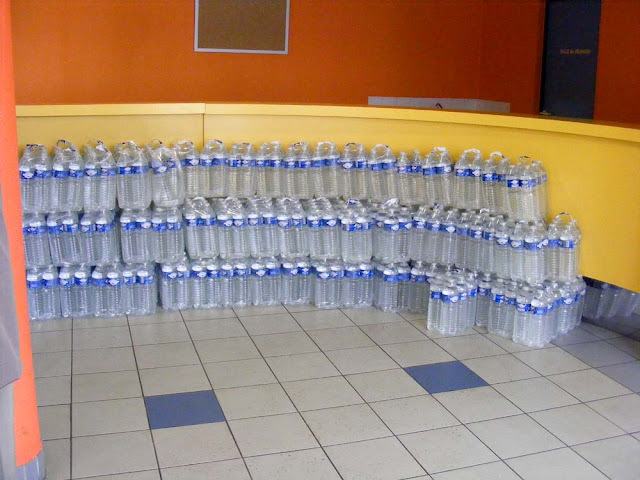 The kids at school had all been given bottled water and there would be a distribution of bottled water for townsfolk at the town hall the next morning (yesterday). 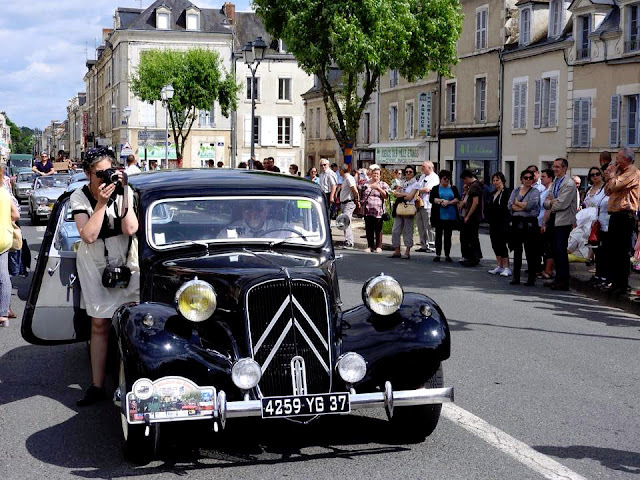 A quick check of the town website revealed no information (except an exciting traffic jam in town in April involving a semi-trailer loaded with a rig for an Airbus wing, which we completely missed at the time). 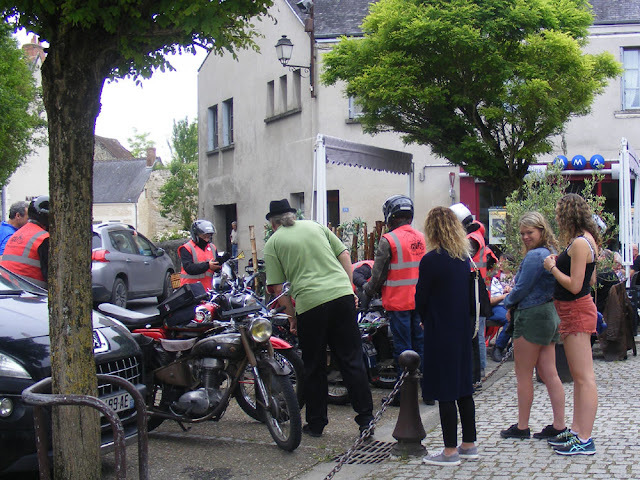 So we duly turned up at the Town Hall to see that the water distribution was taking place from the salle des fêtes next door (which is what we assumed would be happening anyway). There was a queue out the door and a notice. Our allocation was 4.5 litres for the two of us. I asked what the problem was and it appears that as a result of the recent rains and floods the bacteria level in the town water is just at the limit for human consumption. As a precaution the local authority is issuing bottled water. There is no problem with nitrate levels being too high, so if you wish you can use the town water if you boil it, and washing shouldn't be a problem. We just have to avoid drinking the town water crue ('raw' -- there's probably a joke in there somewhere, since crue is also the word for 'flood'). The authorities have no idea at this stage when the situation will be rectified. Notices have been posted on every shop window in town but as yet the news hasn't hit the newspapers. I don't know about local radio because we don't listen to it. I guess this explains why I've had an upset tummy for the past week or so. I normally drink quite a lot of tap water. I quizzed Gérard the Deputy Mayor when I ran into him yesterday evening. The problem is E. coli, and the water tower (Fr. chateau d'eau) will have to be emptied and cleaned. We will need to be on bottled water for some days while the water is retested and the laboratory waits for the culture to grow before they will give us the all clear. We are not the only village in the Claise Valley that has had contaminated drinking water as a result of the floods. 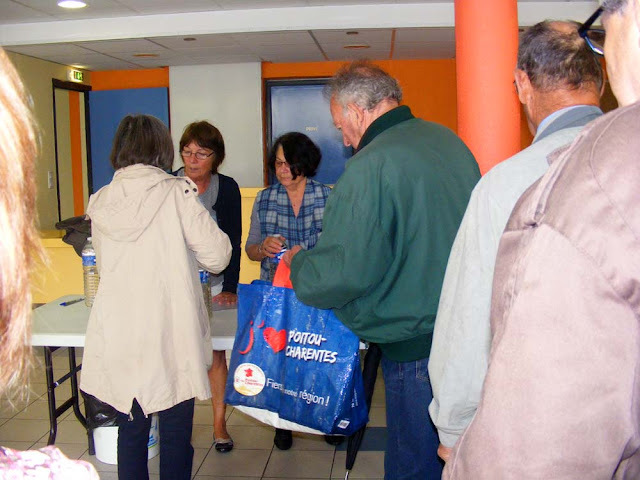 Ten days ago Le Grand Pressigny was also distributing bottled water. According to Gérard that was a different problem though. He says LGP had a broken pipe which was allowing silt in. 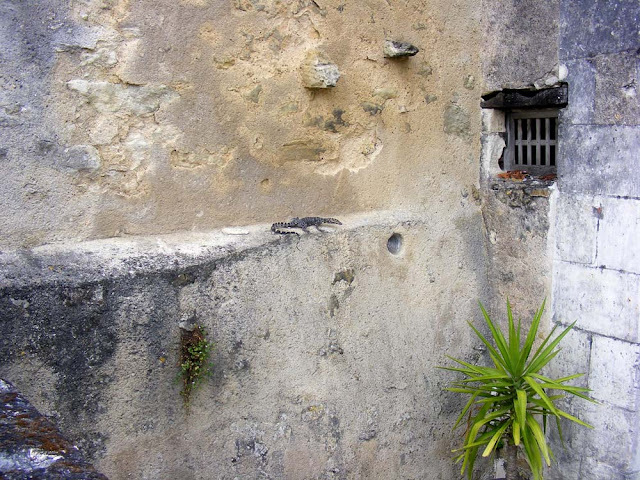 The problem was solved by hooking up to Abilly's water supply until the pipe could be fixed and the system flushed. 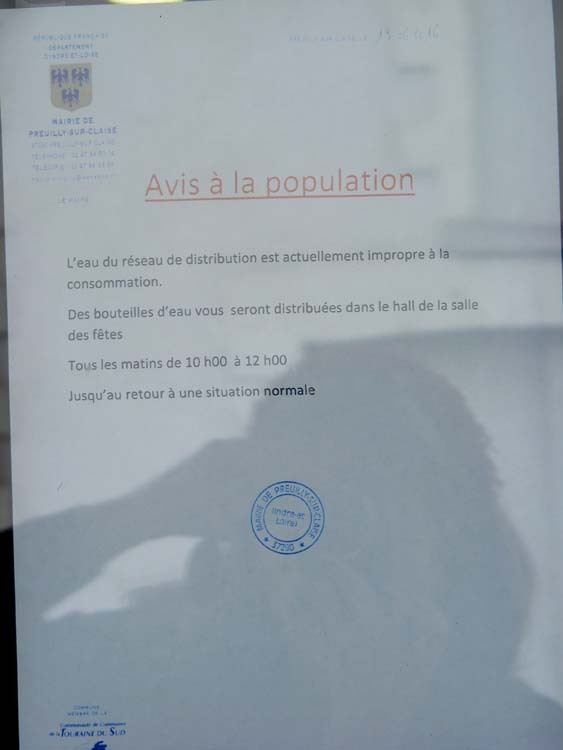 If you're in Preuilly sur Claise today (14 June, 2016) don't drink the tapwater: apparently there is a problem. 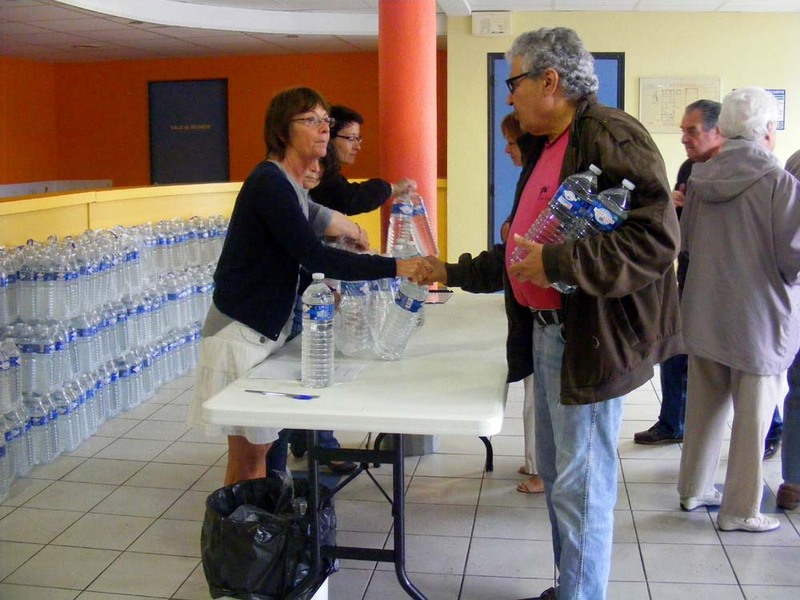 Drinking water (bottled) will be distributed from the Mairie between 10 and 12.30 today. Si vous êtes à Preuilly sur Claise aujourd'hui (14 Juin, 2016) ne pas boire l'eau du robinet: apparemment, il y a un problème. L'eau potable (en bouteille) sera distribué à partir de la Mairie entre 10 et 12h30 aujourd'hui. In the course of being out and about in the heart of France (in the old province of Berry, which is to the east of us and right in the middle of France) we came across two fields of Opium Poppy, in the midst of the more common crops of Barley, Berry Green Lentils and Winter Peas. Try as we might we couldn't get any definite information about this crop. 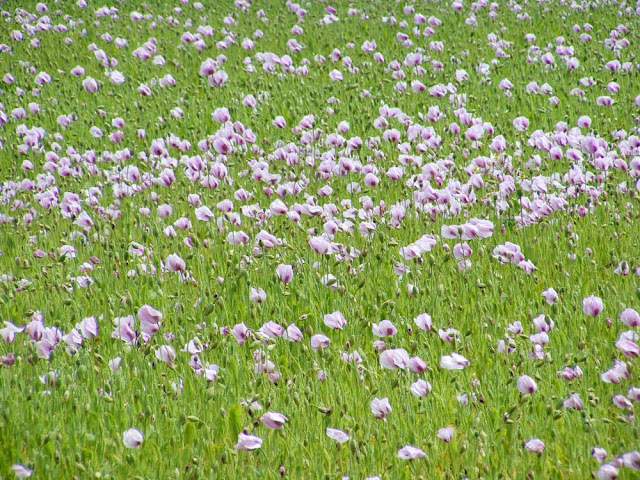 All the same, I suspect this crop might be for pharmaceutical purposes rather than for seeds for bakers. The reason is that based on the appearance of the plant and the colour of the flower I would say this is Papaver somniferum var album, often referred to as White Poppy. The seeds of this variety are white, not black, and usually processed to extract the oil which is used in the pharmaceutical industry, especially in certain cancer treatments, as a carrier for active medications. The remaining pulp also has a commercial value (I assume as animal feed), as does the 'straw' or dried poppy stems and empty seed capsules. If opiates are being manufactured from this crop it will be from the straw. 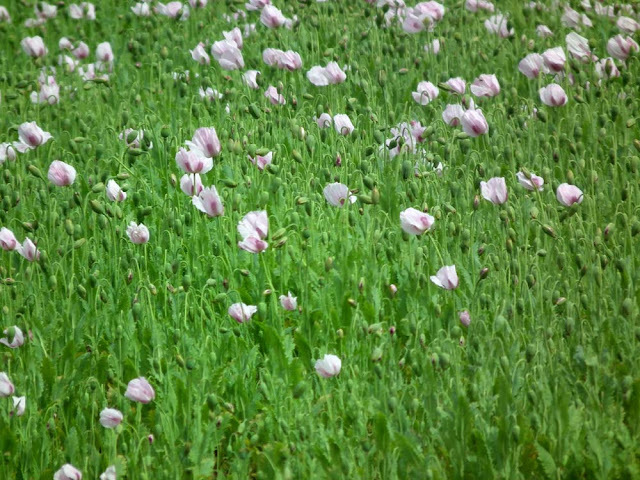 According to Wikipedia, 90% of the world's legal opiates are manufactured from poppy straw, not the seeds, and not in the traditional labour intensive way of tapping the latex from the green seed capsules. 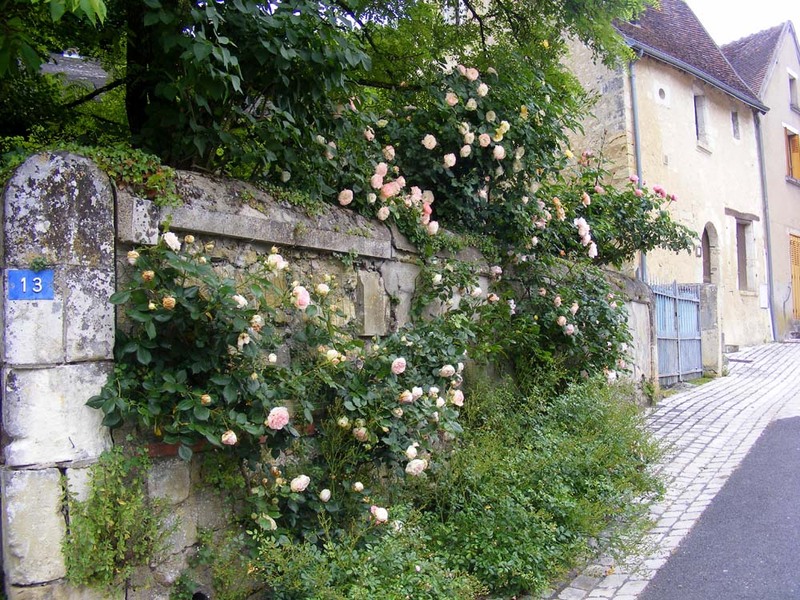 France is the fifth largest producer of poppy seeds in the world. 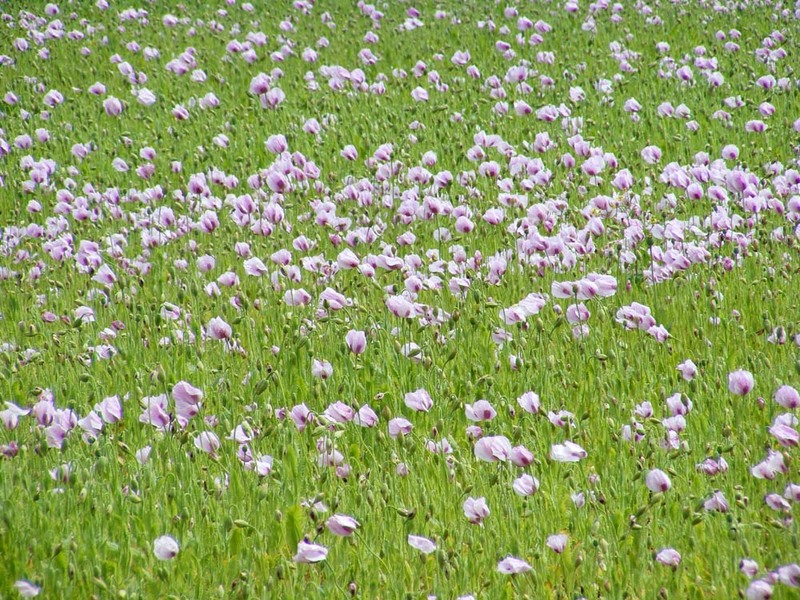 It is one of 20 or so countries around the world where it is legal to grow opium poppies for morphine production (as is Australia, where the industry is centred in Tasmania). Baby News: We would like to welcome Felicity Jiang-Li Stone to the family. She was born yesterday just after mid-day, and looks lovely. Of course. Grandad is pretty bemused - assuming he is going to be "grandad". Names are yet to be assigned. Why Stay? 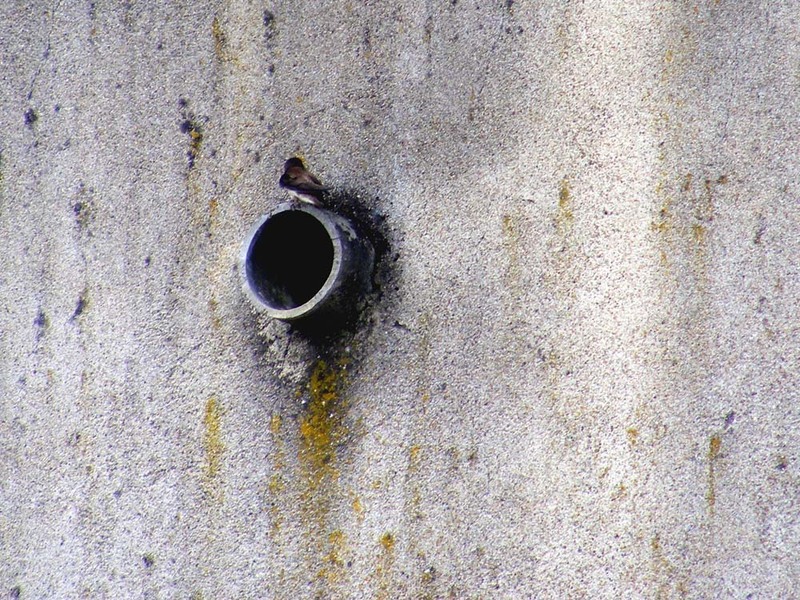 The Brexit referendum looms and Jeff Ollerton has compiled a useful resource focusing on why Britain should stay in Europe from an environmental protection point of view. He points out that the major environmental issues rarely respect borders. As he says, 'Species, rivers, air masses, sea currents, economic resources, waste products: all of them can (and do) move through the different countries of Europe and beyond.' As a consequence, acting unilaterally is useless and he gives some examples of successful EU directives to protect the environment. Another mention of our caravan. If you want a very cheap (and we mean a negotiable 100€) caravan, drop us a line. You'll have to collect it, but that's all. 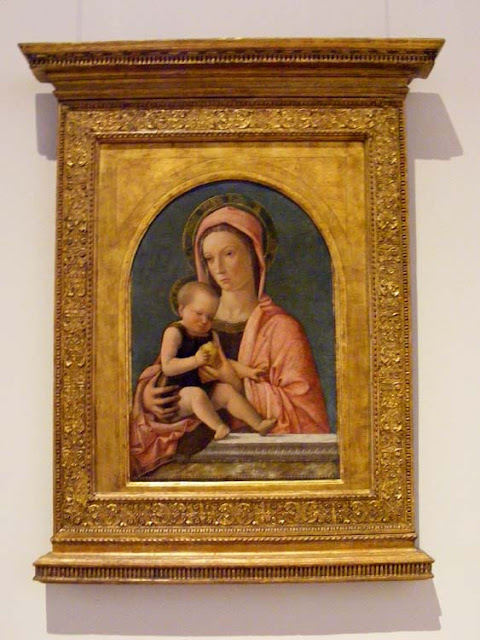 This charming Madonna and Child was painted by the Venetian painter Giovanni Bellini in the first half of the 1460s, in tempera on a wooden panel and hangs now in the Castello Sforzesco. It displays the typical peachy pink draperies for which he is famous, and for which the 20th century cocktail is named Bellini in his honor. The infant Christ holds a pear, one of many symbols associated with Mary, and in this case indicating that the baby is the fruit of her womb. It is interesting that he chooses to clothe Mary in pink rather than the more traditional blue, thus allowing him to make the background greeny blue. I suspect this is in the interests of making the Madonna seem warm and soft, and clearly defined against the contrasting background. The painting is from his earlier works, deeply religious but depicting very sympathetically human subjects. Later his works clearly show his association with his brother-in-law Mantegna, and he is one of the artists Albrecht Durer came to see in Italy. Durer rated him highly both as an artist and as a person, remarking on his generosity and kindness to visiting young and foreign artists. Titian was one of his students. I think his most famous extant work would be his extraordinary portrait of the Doge Leonardo Loredan, hanging in the National Gallery in London, but many of his larger and major works in Italy were destroyed in the Second World War. The Bellini, made of peach nectar and sparkling wine, first appeared at Harry's Bar in Venice between the Wars. 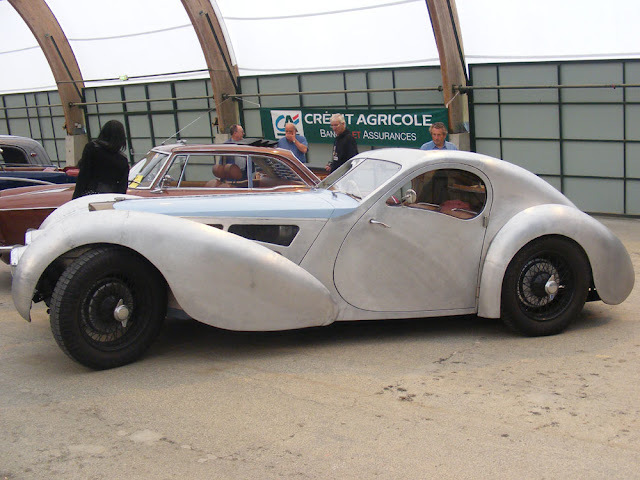 Every Monday our blog post features something from the northern Italian city of Milan. For more Mondays in Milan posts click here. Our friends Colin and Elizabeth have decided to put their lovely house near Richelieu on the market. Colin has created a web page so you can find out all about it, from attic to cellar. He's included lots of photos and a floor plan. 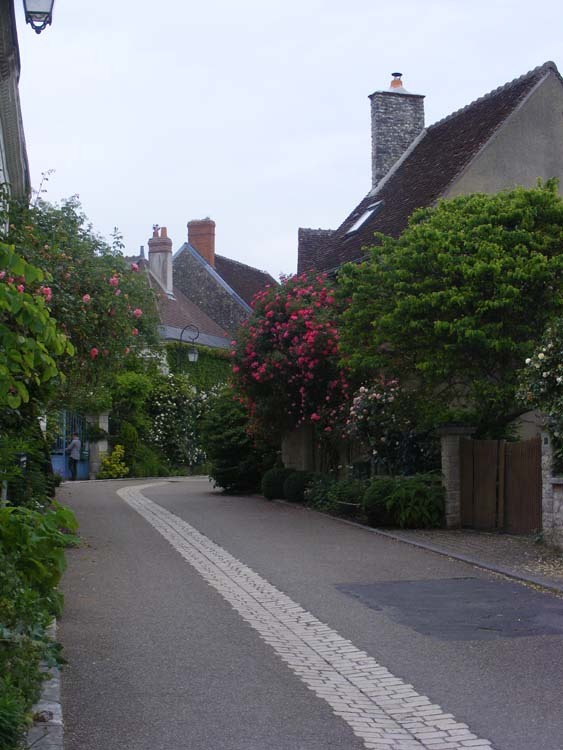 The house is modern, spacious, well appointed and surrounded by a lovely large garden. 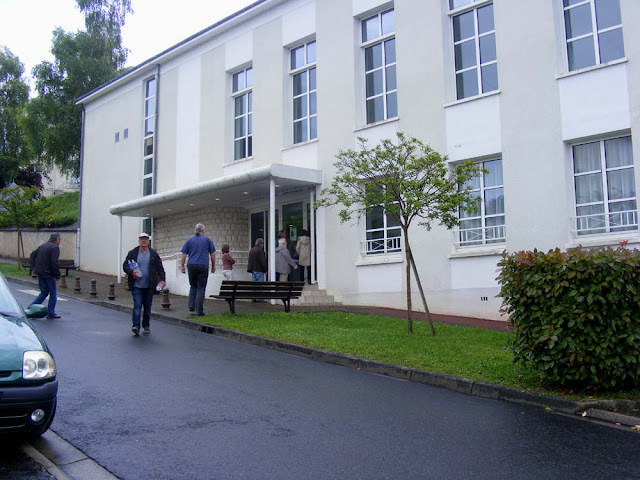 It is in a small friendly village not far from the larger centres of Chinon and Chatellerault which both have good shops, medical facilities and the like. The house would be ideal for someone who loves having their family and friends to stay or who has a large family still living with them. 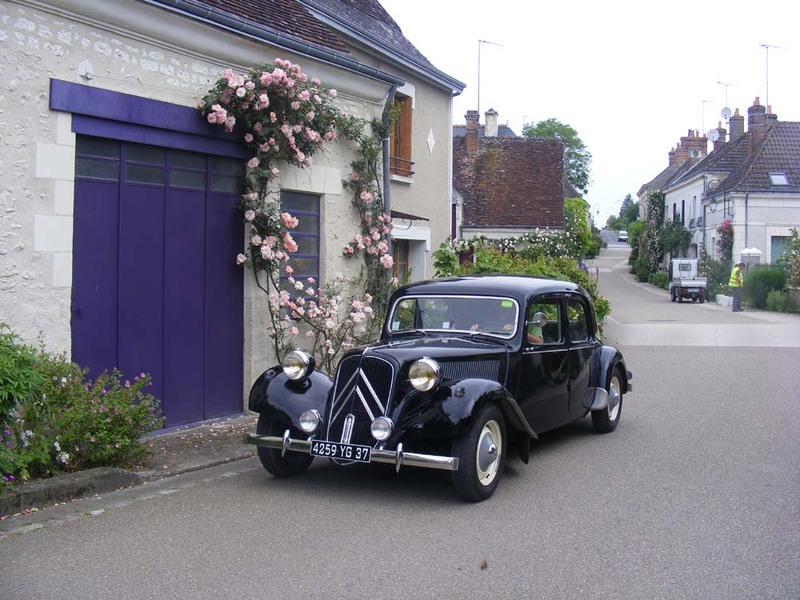 Asking price €275 000. Our friends Tim and Todd have also put their London house up for sale. If you are interested in a sensitively restored large house with small but beautiful garden on the Mile End Road in an area that is very multicultural and you can rustle up couple of million pounds, check it out. Tour de France: The race programme has been published. 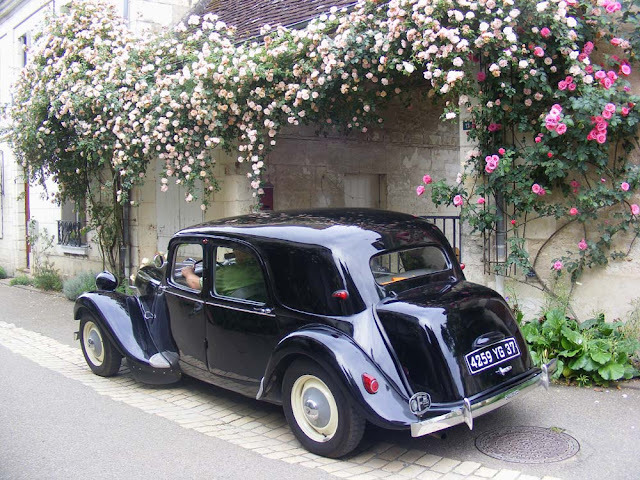 It is coming through the Loire Valley on Tuesday 5 July. 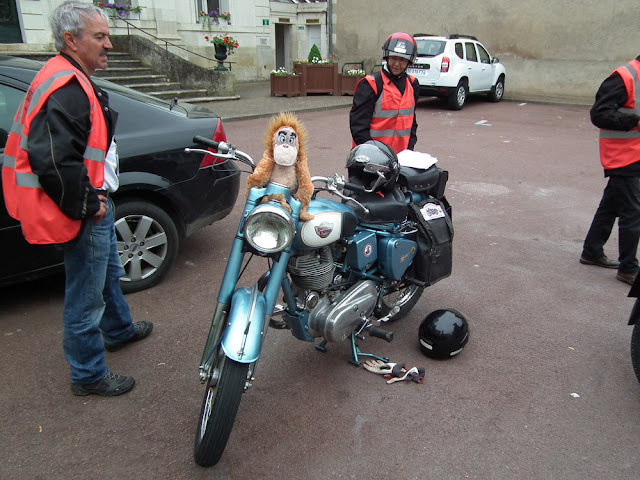 We are planning to catch it at Saint Savin with friends.